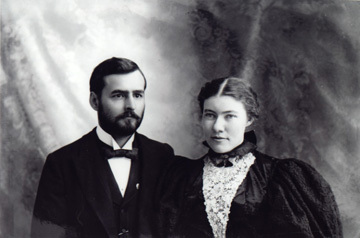 Dr. Clarence E. Hemingway (1871—1928) was a medical doctor, and Grace Hall Hemingway (1872—1951) was a musician and artist. They were parents of Nobel Prize winning novelist Ernest Hemingway. Their parents' homes were located across from each other on Oak Park Avenue. The two became romantically involved when the handsome Dr. Hemingway made frequent visits to the Hall home while treating Grace's mother in her final, illness. They wed and had six children, including world-renowned writer, Ernest. 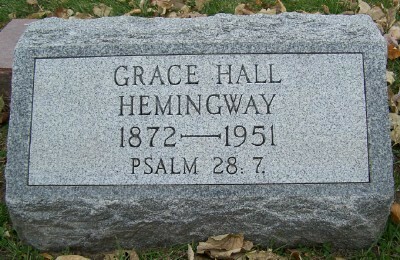 Both Clarence Hemingway and Grace Hall were born in Oak Park and graduated from Oak Park High School. Young Clarence, whose father Anson was a Civil War veteran and realtor, went on to Oberlin College and Rush Medical College before establishing a medical practice in the Village. 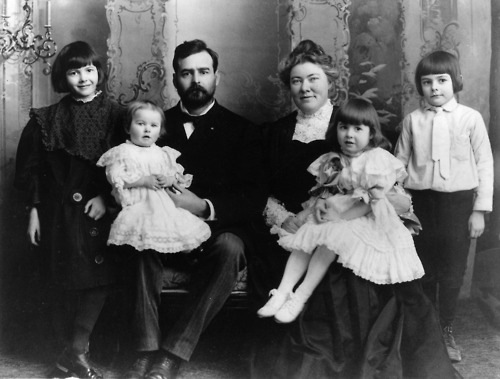 Dr. Hemingway's medical practice thrived, and his horse and buggy were a familiar sight at least until 1912. He shared his love of the outdoors with his children, often taking them along on hunting and fishing trips. 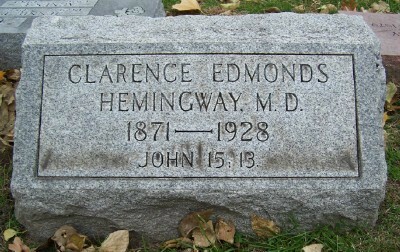 Clarence would bring Ernest to Forest Home Cemetery to see the Haymarket Monument. He suffered from depression while despondent over a diagnosis of diabetes he killed himself with his fathers Civil War pistol in 1928. Grace was a noted singer, as well as a piano and voice teacher, whose efforts often generated more income than her husbands practice. Formally trained as an opera singer in her youth, she was accepted by the Metropolitan Opera Company and made her debut at Madison Square Garden in 1891. She gave up a career on stage to concentrate on rearing her children and fostered Ernest's early writing efforts. She was an active campaigner for women's rights who served on the Illinois State Suffrage Commission and belonged to a variety of community organizations in Oak Park, including The Nineteenth Century Woman's Club. In her later years, she became interested in painting and produced over 600 works. The inscriptions on their gravestones refer to Bible verses. Dr. Hemingway's verse, John 15:13, is Greater love has no one than this, that he lay down his life for his friend. On Grace's stone is Psalm 28:7, The Lord is my strength and my shield; my heart trusts in Him and I am helped.